The DTM Monthly Regional Update contains consolidated summary updates and highlights from DTM field operations. 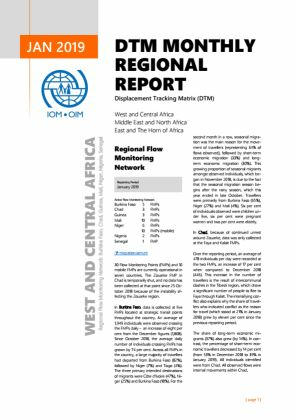 This document covers updates from the regional network of flow monitoring of migrants, as well as the tracking and monitoring of internal displacement in the different countries. It is published on a monthly basis and currently covers three regions: West and Central Africa, Middle East and North Africa, and East and the Horn of Africa.